Tip: Always use fresh ingredients – in your summer salad add nice crisp lettuce to make your salad extra crunchy! Welcome welcome foodies! Summer has arrived and we’re sure you’re going to see lots of sun this year! There’s nothing nicer than kicking back in the garden, putting the feet up and digging into a healthy salad on a hot summers day. This month we’ve put together a delicious Summer Salad, packed full of flavour, and a gorgeous homemade dressing that you can put together in no time. Lately there’s a big increase in demand for healthier food options with people taking more of interest in healthy eating and exercise – a trend that’s great to see. We’ve made sure to select ingredients that are really nutritious making this salad a perfect option for either lunch or dinner. Place bacon on tray and put into 180C fan oven, turning once halfway through the cooking process. While the bacon is sizzling away nicely fill a pot of water 2/3 full and bring to a gentle simmer. Add salt and white wine vinegar to aid in stabilising the egg white. Prepare your salad vegetables and put into a large bowl. Heat a large non-stick frying pan, add 1tbsp of olive oil and fry your black pudding until crispy. Remove the bacon when cooked and add the croutons to the bacon fat, toss and cook for 5 -10mins until golden brown. When your water is gently simmering, not boiling, stir with a spoon until a vortex is achieved, crack the egg low into the vortex and cook for 4-8mins depending on your choice of doneness. Ad all the remaining dressing ingredients into a jar with a lid and shake well to combine and mix them. 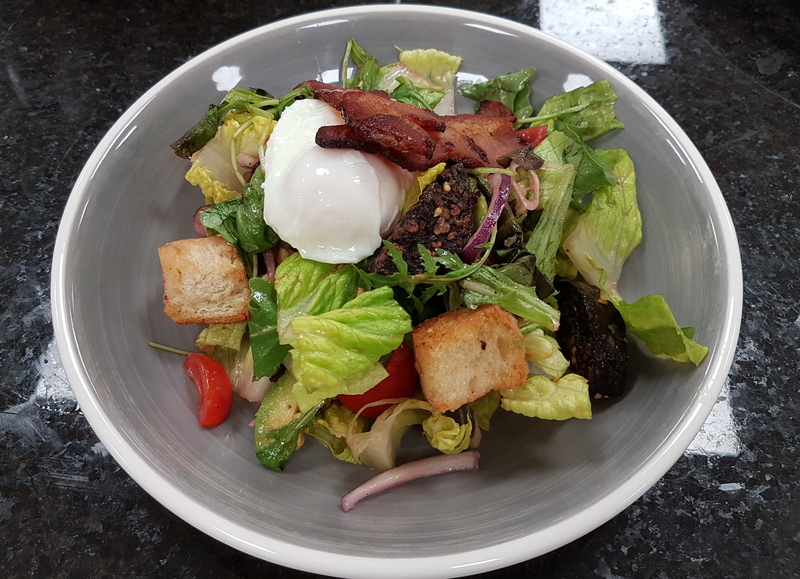 Finally add the black pudding and croutons to the salad mix, pour a drizzle of your homemade dressing over the salad and toss to mix all the ingredients. Serve in a bowl with the egg on top and crispy bacon crisscrossed over it. If you are that extra bit hungry or perhaps want to have this salad as a main course for your dinner you could include some strips of plain or Cajun chicken. We’re always trying new ideas in our Innovation Centre and love experimenting with new flavours. Don’t be scared to try new things yourself when you are cooking at home. The more you practice the better you’ll get and chances are you’ll come up with something spectacular to amaze all the family! If you’ve a particular dish in mind and would like us to create a recipe for next month why not contact us and we’ll get our chefs to come up with a nice recipe!